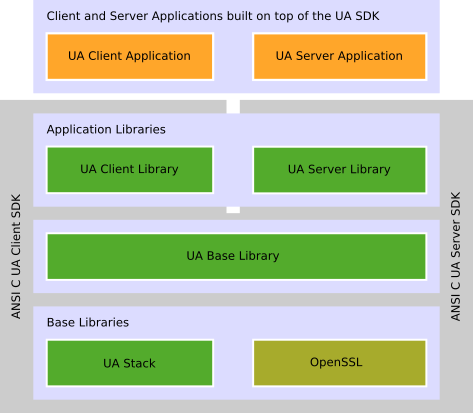 The SDK/Toolkit simplifies the UA stack APIs, implements common UA functionality needed in most or all UA applications, provides base functionality and helper functions, implements the security handling and provides samples for common use cases. The application provides or consumes information via OPC UA. This layer contains the application specific logic and a mapping to OPC UA using the OPC SDKs. The ANSI C OPC UA Server SDK provides an ANSI C library used to develop OPC UA Servers providing a standard interface to vendor specific systems. The OPC UA Server is usually used to describe the available information from a vendor system and to provide access to the data for external systems in a standard way. The ANSI C OPC UA SDK is a compact OPC UA SDK designed for embedded devices which provides the basic infrastructure to create an OPC UA Server. As toolkits cannot be certified directly, the certification process has been made using an application (OPC UA ANSI C Demo Server) that comes with the ANSI C OPC UA SDK and has been created using the SDK.